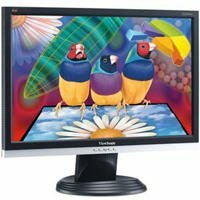 ViewSonic's 22" VX2240w widescreen LCD delivers unparalleled performance with ultra-fast video response as fast as 2ms, 4000:1 dynamic contrast ratio (typ) and Super-HD 1680X1050 resolution. Games, HD movies, videos and graphic-intensive applications have never looked better on your desktop. This Vista premium certified widescreen display enhances productivity by allowing you to view two documents side-by-side or to work in two applications without toggling. Connect your game console, DVD player and other components through the digital (DVI-D) AND analog inputs. The Kensington security port provides theft deterrence and the OSD and power lock prevent unauthorized changes to your optimal screen settings. Dimensions - 20.1" x 17.0" x 8.8"
This is a horrible monitor for Photography or Graphic Art. It can not be calibrated!!! I contacted View Sonic when I realized that the calibration wouldn't "hold" (it kept resetting itself each time I turned the monitor off). The tech at View Sonic didn't know what it meant to calibrate a monitor. She couldn't find it anywhere on her computer's "help" menu for helping customers. Any monitor company that doesn't train their employees to help customers with monitor calibration doesn't know anything about graphic art or photography. Do not buy a monitor from View Sonic if you're going to be using it for color accurate purposes. Good product, but unless you are using it for spreadsheets,games,etc., you don't need it! A regular size 19" is all you really want for E-mail, most websites, etc. I've had the monitor for over a month and it's definitely a mixed bag. I have a dual G4 Mac running 10.4.11. The color is very good but you need to play with the custom settings, all the presets are way too bright. Even in the custom settings you need to turn all the colors way down. Text does not render well and I can't seem to make that any better. Video looks great using all the players I tried. Absolutely Terrible Service!!!!!!! Products cannot last longer than one year! Just got the ViewSonic monitor for 1 year, and it breaks!!! I called ViewSonic's customer service and tried to reason with them, absolutely terrible customer service! The representatives were very rude, they even hang out on me. Apparently, hanging out on customers is the best way to avoid any "problems" for the customer repensitives. I have such a bad experiences with ViewSonic, I will never purchase any products from them ever again! I think everyone deserves to know about what the company's services are like before their purchase. Please be aware when you buy any of ViewSonic's products! I bought this monitor to replace a 17" Dell CRT. I absolutely love all the real estate! I use this monitor mainly for everyday web browsing, Word documents, and gaming. The colors are bright, icons are crisp, and the response time is great. I have had no dead pixels, and I have owned this LCD for approximately a year. This monitor does have backlight bleed at the top and bottom that is noticeable when the display is showing dark images. I don't really mind it, and was aware of it before buying. Also I've noticed photos look muddy in shadows. I have tried the Windows image viewer and Photoshop with the same result. The same photos viewed on a laptop look much better. This might be corrected by calibrating, but I haven't been able to easily. The monitor setup was straightforward-one note though, I was replacing an old 19" ViewSonic so I was already familiar with their menu system. No stuck pixels, I don't notice any light or dark bands. Colors are good, text is crisp and clear. Resolution is excellent, it's going to be fun trying to fill up all the extra real estate, there's room for all but my biggest spreadsheets. I have been a fan of Viewsonic products for many years. They have always been the clearest and most detailed monitors, far surpassing any other manufacturer, especially with their graphics series. They are exceptional in performance and versatility. My only complaint was that my last CRT monitor lost it's black tone after only three years of use, so I was concerned about the latest product line. I have a Viewsonic VX2035WM at my office and was very impressed with it so I opted for the larger VX2240W at home. So far it is exceptional in every way and easily compares very much to the graphic series but is superior to the value series. I did not notice any real difference between using the digital or analog outputs but I decided to go digital. I do not think the adjustability is a problem at all since the tilt is slightly down which prevents external glare. The only issue I have is the mail-in rebate and wish it would have been an online credit instead.